Fraxel Dual is a laser procedure that can treat sun damage, pre-cancers (actinic keratosis), acne scarring, and fine lines and wrinkles, as well as pigmentation issues like age spots, sun spots and melasma. Fraxel Dual resurfaces the skin by causing controlled micro-injury. Results develop as the body heals itself, replacing the old, damaged skin cells with new cells, increasing collagen production and breaking up pigmentations and textural issues. 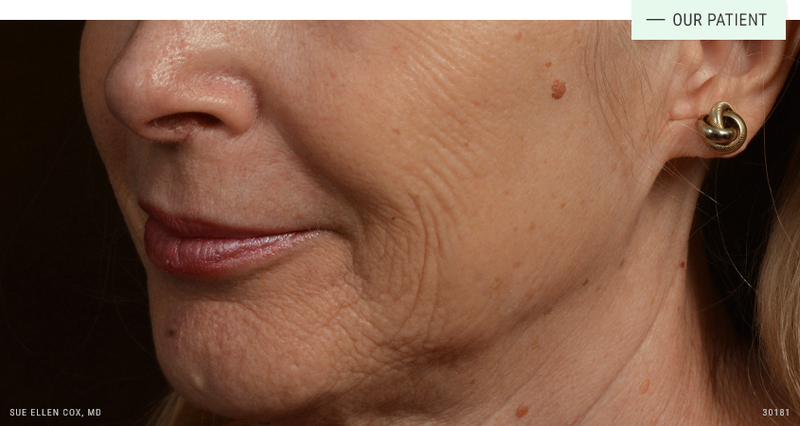 Fraxel is a non-ablative laser, meaning it heats the targeted tissue without destroying it. It is appropriate for moderate sun damage, pigmentation and textural issues. It is especially effective in reducing the appearence of sun damage. 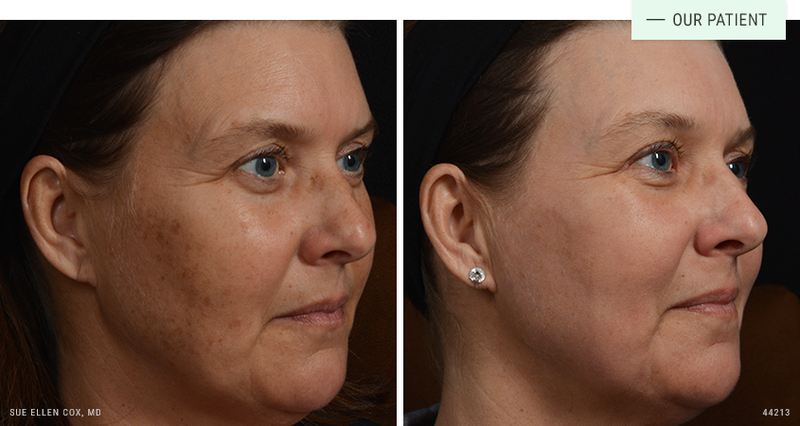 Before | After: Fraxel effectively treats sun damage and pigmentation, and also improves skin texture. The FDA has cleared Fraxel Dual to safely treat a number of issues related to skin texture, tone and pigment. It has an excellent safety profile. Like any surgical or non-surgical procedure, there are risks. As a teacher and trainer of other physicians in laser procedures, Dr. Cox stresses the importance of finding an experienced physician who understands the finer points of laser treatment. How long does recovery take? Fraxel Dual is well tolerated. Before the procedure begins, a topical numbing gel will be applied to the treatment area. This will minimize discomfort during the procedure. The procedure itself typically takes less than 30 minutes. Patient report a sensation of heat, and may experience mild discomfort. Fraxel Dual requires downtime. Recovery is characterized by predictable stages that usually resolve within a week of treatment. Immediately after the procedure, the treated area will appear bright red, and feel very warm. Over the coming week, most patients experience some degree of minor itching, dry skin, and peeling or flaking. You may notice that your skin appears to have a “gridded” or “pixilated” look. Your provider will give specific instructions about what to expect for your particular treatment and how to minimize side effects. Fraxel Dual may be used on most areas of the skin, including sensitive areas like the hands, chest, neck and face. It is possible to treat multiple areas of the skin in a single session. You can expect a reduction of textural issues, such as pore size, fine lines, scars, wrinkles and creases, as significant improvement of unwanted pigment and sun damage, including precancerous actinic keratoses. Patients are typically happy with results from one treatment, although a series of treatments may be required to best address certain concerns. 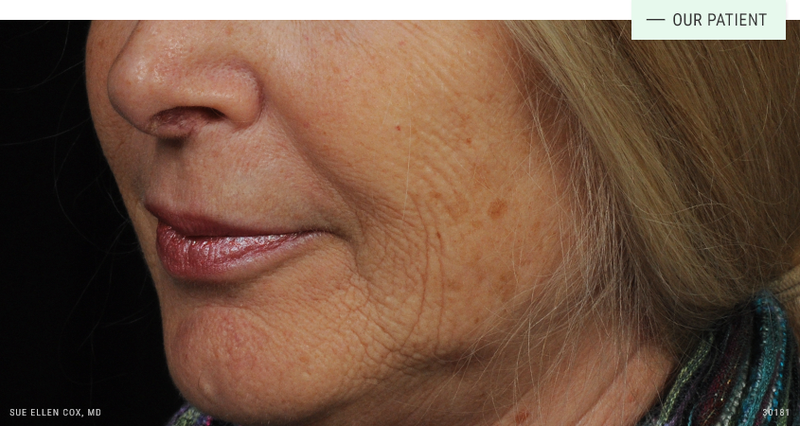 Before | After: This patient received one full-face Fraxel treatment to address sun damage and diffuse brown pigment. 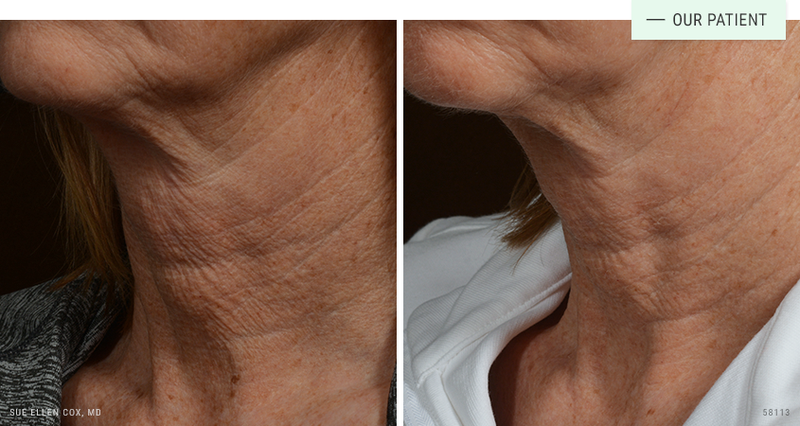 Before | After: We frequently treat off the face, including the neck, chest, arms, hands and more. Our state-of-the-art laser and devices center is led by Dr. Cox, a published expert in these treatments. Our team specializes in advanced and combination treatment. Dr. Cox is so patient and kind and explains every procedure and takes time to answer all questions. Jamie and Anita are very attentive and pleasant. I would recommend Aesthetic Solutions to friends, family and others who have asked me about procedures. I definitely intend to revisit for further procedures. I never felt rushed at any time. There are no words to express my sincere appreciation to Dr. Cox and her staff for the compassion and expert care that was shown to me after a severe burn at a medi spa. She showed concern for the mental and physical trauma of this experience. I have never received more thoughtful care from any Dr. or staff. She has corrected the damage, which has taken over a year. I believe Aesthetic Solutions to be the #1 practice in the Triangle area for dermatologic care!